Recurring deposits (RD) with banks are one of the most popular investment options for people with regular income. RD enables to deposit fixed amount every month for a pre-defined period which earns interest similar to Fixed Deposits (FD). You might want to bookmark this page as the RD interest rates would be updated every month which would help you in better decision making. There can be penalty for missing even one installment. Most banks offer Loan/Overdraft against the amount available in Recurring Deposit. The interest is generally 0.5% to 1% more than that offered to RD. The Post Office offers 5 Year Recurring Deposit Scheme offering 7.30% interest rate. The table below gives the Interest Rates sorted by Bank Name. The best interest rates for all duration have been highlighted. 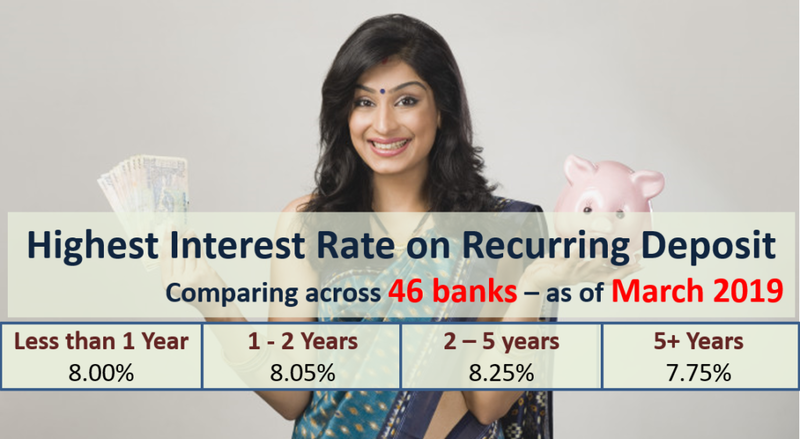 Disclaimer: The Recurring Deposit Interest Rates keep on changing. You are advised to check the interest rates with banks before making your RD. Who should open Recurring Deposit? Recurring Deposit suits people with regular income and who want to accumulate a fixed amount for certain time frame. It’s also for people who do not have lump sum amount to take advantage of high interest rates. Those can open a long term RD which offers same interest rate as FD and keep on depositing money regularly. But if you need to put a lump-sum amount use fixed deposit. In case of RD the interest received is added to the income and taxed at marginal tax slab. Since June 1, 2015 banks would deduct TDS at 10% in case the interest on Recurring Deposit is more than Rs 10,000 in the financial year. This interest would be added across all branches of a bank and across all RDs for a customer to calculate the TDS. Also Read: How to Fill Form 15G/H to avoid TDS? Can I withdraw Online,my RDwhich is matured. When you open your RD, you are asked to choose if you want to invest the maturity amount back automatically or want to credit the maturity amount to the linked saving account. On maturity Rd will do what you had chosen then. The good thing is you can close your RD prematurely mid-way online. Is Rd deposite in post office is taxable at final withdrawl? There is no TDS on Post office Recurring Deposit. But if your income falls in taxable range you need to pay taxes on the interest earned on RD. The interest rates offered are generally lower by bigger banks and higher by smaller banks. As The Ratnakar Bank is concerned it’s small private bank and is not listed. Also as it’s small bank the branches and so the customer reach is limited – so relatively lesser known. It’s safer than co-operative banks but not as safe as larger private banks like HDFC, ICICI or Government Banks like SBI. You also might be aware that deposit up to Rs 1 Lakh is insured and so there is no risk up to that amount. I think you should also include the recurring deposit scheme of India Postal Department. Just for comparison. I recently heard about one Pvt bank giving 12.5% ..
As per the chart shared over here does Ratnakar Bank is really above all the banks providing higher interest rate on RD’s. Are they always on the top of every bank on every month/year in terms of Interest rate. Yes for most of the months I have compared Ratnakar Bank is among the top in terms of interest rate offered on fixed/recurring deposits. It’s among the smaller private banks and lower reach relatively due to less branches and hence have to offer more to compete. Also Tamilnad Mercantile Bank, DCB Bank, Dhanalakshmi Bank and Lakshmi Vilas Bank – all smaller private banks are among the banks offering higher interest rate on fixed/recurring deposits. Please check the update date just before the table – it says last updated on – September 1, 2015. If you check HDFC Bank RD rates – it was updated on September 8, 2015. We update the most recent RD rates every month. For October we would be doing after October 5 as many banks would be changing their lending and deposit rates then. You can find the highest interest rate looking at the table in the post above. To choose between fixed deposit Vs recurring deposit, it’s simple. If you have lump-sum amount go for FD and when you have regular income go for RD. Yes technically you can open RD account without savings account but I think bank is going to ask for linked savings account for regular auto debit and it also becomes more convenient both for the bank and the customer. Hey amit , nice stuff. I don’t think banks would give any kind of loan without any security (except for low ticket priority sector loans/ education loan). However there would be few Government schemes which might offer loans to upcoming startups. You will need to search for it. Which is the best bank to maximum RD rate? Thanx Amit for useful information… Would like to know about mutual funds. No you need to pay tax on interest received on RD. There used to be no TDS on RD and so many people take it to be tax free. Going forward Budget 2015 has proposed TDS on RD, so this advantage is gone now. thanks a Lot Amit for the one stop and comparative concise information. Kindly guide us about the Fate of Ratnakar Bank, which is offering the highest R.D Flat Interest rate of 9.5%? Is it something dicey since? Ratnakar Bank is a private bank and its safe to invest in its FD/RD. This is well regulated by RBI and so nothing much to worry about. The most worrisome lot is the cooperative banks! If you are talking about cooperatives of North India could be true… But in places like Kerala and Karnataka where cooperatives are pretty strong and a lot safer than the small pigmie commercial Banks, deposits in these banks are as risky as in Commercial Banks. May be what your are saying might be true – Some cooperative banks might be stronger. But if you look back in history co-operative banks had the maximum closures. Amit I just want to invest fix money on monthly basis for fix time so that i used for my children education or marriige. Its very hard to suggest in comment about investment for children marriage or education. But if you have risk appetite and your goal is more than 10 years away, you should start SIP in few good equity mutual funds. As you approach near the goal you need to redeem this and start putting that in Debt mutual fund or FD/RD. Its a good fund – you can stay invested. thank you amit, it was informative.